Stainless steel vacuum travel mug. Keeps hot drinks hot and cold drinks cold for up to 6 hours. 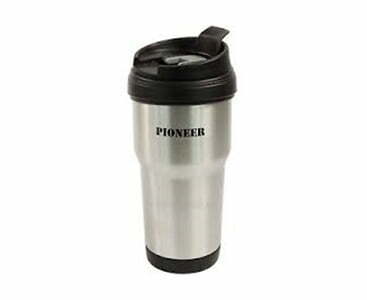 This Pioneer stainless steel travel mug is the must have product for coffee or other drinks on the go. Simply brew in the morning and rely on this insulating mug to keep your drink hot or cold for up to 6 hours. This product uses vacuum technology to prevent any leakages or accidents, so simply put in your bag and start your day without worrying about spillages. Use this travel mug for a range of hot and cold drinks, including coffee, tea, water, juice and more. Even use it for food items such as porridge or soup to enjoy later on in the day. This reliable product will keep hot drinks hot and cold drinks cold for up to 6 hours when you are out and about. The stainless steel exterior and Grunwerg technology will keep your drink at the perfect temperature. This is perfect for brewing tea or coffee in the morning to enjoy at work. This is product is dishwasher safe which makes it easy to keep clean between washes. We recommend washing between every use to maintain hygiene and to not alter the taste of your beverage from leftover residue. Grunwerg has been producing high quality products from premium stainless steel for over 70 years. They are a Sheffield based company which are a favourite amongst many customers and suppliers for their consistent quality. Their unique capability for creating functional and stylish designs for their products is what makes them a favourite in the world of houseware and catering. We stock some of their other products such as stove top espresso makers, cafetieres and flasks. This travel mug is perfect for camping, hiking, walking, holidays and much more. This product is the perfect addition to any coffee lover’s routine as it allows you to enjoy hot coffee all through out the day. Rely on the leak proof vacuum seal to contain liquids and not leak into your bag or belongings. Simply flip the seal to enjoy your drink. The simple and sleek design is classic and modern which makes it a great gift for a loved one.